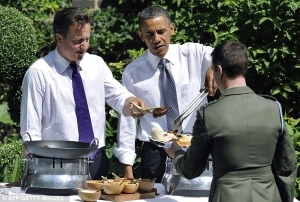 David Cameron and Barack Obama today served hotdogs and burgers to service personnel in the 10 Downing Street garden. The UK and US leaders and their wives Samantha and Michelle served food to 150 UK and US service personnel. The menu appeared to reflect the strong transatlantic bond the two countries have insisted upon so firmly, featuring both British and American dishes. British sausages, Kentish rosemary lamb chops and hot Jersey Royal potatoes were served with American staples such as hamburgers, corn on the cob and coleslaw. There was also a tomato, mozzarella and basil salad and Caesar salad, followed by a dessert of summer berries and vanilla ice-cream. The bilateral partnership was further symbolised by the interspersed Union flag and Stars and Stripes bunting draped overhead. 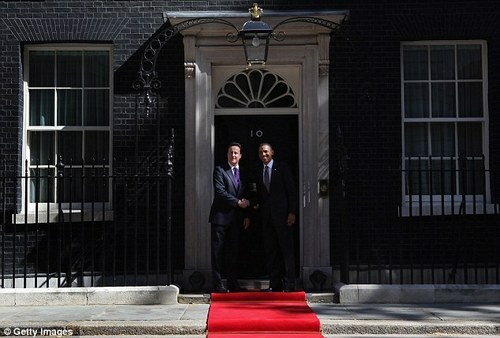 Today was the second full day of Obama's state visit to the UK, only the second by a US President. The President should have arrived yesterday but actually arrived on Monday night from Ireland due to the disruptions to flights caused by the erupting Icelandic volcano. Following the barbecue, Obama and Cameron gave a joint press conference in which the Prime Minister said Taliban must make a 'decisive split' with al Qaida if a political settlement in Afghanistan is to be brokered. 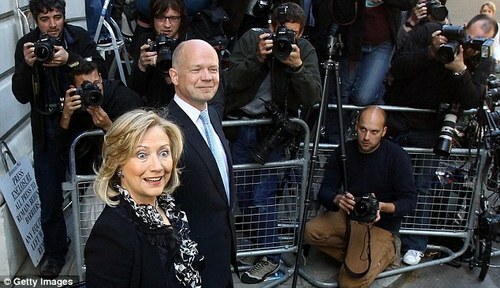 Speaking outside Lancaster House in London, Mr Cameron said the U.S. operation against Osama bin Laden represented a 'strike right at the heart of international terrorism'. Mr Cameron said the next 12 months represented a 'vital year' in Afghanistan, while British and American troops had 'broken the momentum of the insurgency' in the country. Yesterday, after being greeted by the Queen and the Duke of Edinburgh at Buckingham Palace, the president and first lady met newlyweds the Duke and Duchess of Cambridge - performing their first Royal engagement together since their April 29th wedding - before Mr Obama laid a wreath at the Grave of the Unknown Warrior in Westminster Abbey. Mr Obama and Mr Cameron then dropped in on a south London school where they took off their jackets to play two schoolboys at table tennis. But the Anglo-American team took a sound beating at the hands of 16-year-olds Jason Do and Jamiyu Mojaji at the Globe Academy in Southwark. Mr and Mrs Obama then attended a star-studded state banquet in the president's honour at Buckingham Palace last night as the Queen hailed the US as Britain's 'most important ally'. 'I firmly believe that the strength of our links and many shared interests will continue to ensure that when the United States and the United Kingdom stand together, our people and other people of goodwill around the world will be more secure and more prosperous,' the Queen said. Responding with his own toast, Mr Obama spoke of the 'rock-solid foundation' between the two countries. This afternoon, Obama addressed the House of Commons in the beautiful Westminster Hall, the oldest part of the Palace of Westminster - which is home to the two Houses of Parliament - which was built by William the Conqueror's son. The rest of the Palace of Westminster dates only from the Victorian Era after the previous Palace was destroyed by fire in 1834.